This was that trip which was postponed so many times that there was a certain amount of uncertainty working in the atmosphere, but it finally happened in the end. Yes, it is one of the more recent trips compared to those about which I usually write late – but not this time. This also happened after a long month of driving and travelling due to the large number of functions which I had to attend, something which also made sure that I won’t get to make a memorable journey and I might miss a good number of movies, one of them being Arikil Oraal. So, the journey started very early in the morning, making sure that I would be there at my first destination before ten in the morning, so that there would be enough time left even if the wandering process becomes slow due to any reason including a rain which kept on threatening to come down with full power. The journey took a small break at the Indian Coffee House at Koratty which is more of the right place to stop and have some early food before the journey gets tougher, as there was more than a good one hundred kilometres left to travel, and that is something I am usually careful about. Talking about Indian Coffee House, it is that place where we always stop, if there is the presence of that restaurant chain at the place we travel through. I would recommend the Poori Masala there, and mostly it is what I have, even as that world is more extensive. The Vegetable Cutlet might also impress a good number of the customers. Tea is always there in my list whatever I have, that is for sure. There is something about the place, and may be it is the trust, the faith that one has on a place which is not that much of a vampire of the stomach as you think about the other places providing food. Angamali and Chalakudi also have the same food chain, on the same side of the road. Once Pattikad is reached, the same destination or food is on the other side of the road, just after the town. They usually open between 7:15 AM and 7:30 AM as I have noticed. It was good to have breakfast there, as there was no time to think once Trichur was behind. The great road supported by the eighty rupees of awesomeness (toll) was over, and slowly the potholes began to take over, and soon there were less roads and more the lack of it, to quite a shocking extent. The roads were destructive to the vehicles, and considering the traffic which was on that road, it was quite shocking to see such a pathetic state of the path. Even the bigger trucks and buses were having a tough time, and the scooters and motor-bikes were taking the zigzag paths. It was to that pandemonium that we entered, and survived. There is no survival of the fittest here, but the survival of the luckiest. The first place to visit was to be a fort, but before that, there was a church, The Holy Trinity English Church which was a beautiful structure on the way to the Palghat Fort. It was not easy to miss that building, even from a distance. It was special where it was located. It looked new, but not yet out of its glory of antiquity. It was a great place of worship. The predominant colours of the outside were black and white, and on the inside, there was the glorious white. The altar had the shades of green, blue and red with lots of wood. Even in the middle of the town, as vehicles struggled to find their way out of traffic jams, there was peace and serenity in there, which was admirable. The first place to visit is actually the Palakkad Fort, also known as Tipu’s Fort even as it was built by his father Haider Ali, the Sultan of Mysore in 1766 and it still remains one of the best preserved forts in Kerala, sharing the glory of history with Kannur St. Angelo Fort, Kasargod Bekel Fort and Thalassery Fort, three of the most popular, the largest and the better maintained fortresses of Kerala. The one in Kannur is mentioned here https://theviator.wordpress.com/2013/04/01/kannur/ as part of that earlier journey which happened last year which was surely a longer one as part of a road trip which clearly tested a Chevrolet Beat. I would also personally prefer the Kannur St. Angelo Fort the most, if one is looking for historical awesomeness, with its location and the visuals. But our Palakkad Fort is the one of its kind which is close enough to Central Kerala and one of the best historical monuments in this part of the state, and therefore has its own awesomeness which competes with the same from other forts. Palakkad has always been a strategically important place for anybody who had control over the place, which should be why Haider Ali constructred this fort after his arrival. 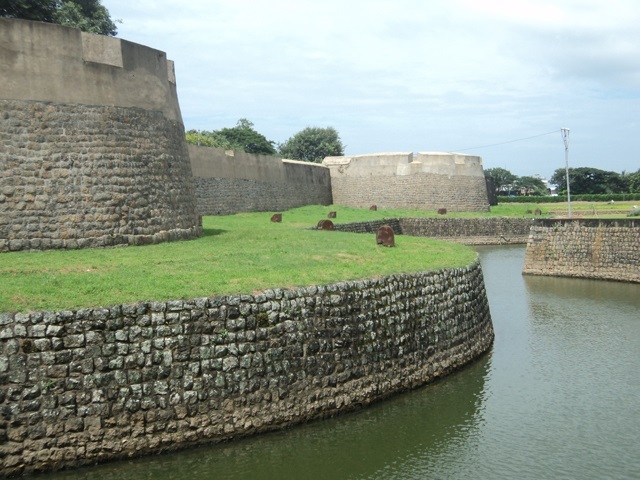 The fort was in the hands of Mysore, Zamorin of Calicut as well as the British. Considering the man behind this well-built structure, it would be been better called Haider’s Fort though. It should have been a good stronghold in the final Anglo-Mysore War which ended with the siege of Srirangapatnam and the death of Tipu. We have surely seen bigger forts in different parts of the world, but this one has a little special life of its own. It has a taluk office and a prison inside it, along with a park on the side, as well as a children park on the side of that park. There is also a small temple, beautiful pond and a large number of huge, old trees which seems to be so alive, both inside and outside the structure. As Archaeological Survey of India preserves the place, and ther is no entrance fee to the fort, there is no doubt about its possible rise in popularity. The fact remains that it is not my first visit here, as I have been at the same place as a kid, it is just that I can’t remember much of it except for, may be a tree. Well, in the district which slightly edges Idukki to be the largest of Kerala, and at the town which looks small or moderate from one side, but is actually quite big, there is surely no shortage of tourist attractions. One can easily travel to Kalpathi, famous for its Kalpathi Ratholsavam, a big Temple car festival, and also check the Chambai village. Nelliyampathy Hills is another suitable choice. Jainimedu Jain temple is also not that distant from the heart of the town. Dhoni Waterfalls is situated around fifteen kilometers from the town of Palakkad, and no, it is not named after the cricketer who do strange stuff at the cricket pitch. But the place you would wish to visit the most might be Malampuzha, which has a dam, amusement park as well as an incredibly beautiful and well preserved garden with sculptres, paintings, fountains, hanging bridges and all that can add to a beautiful day with nature. It also has a fish-shaped aquarium, a snake park, a ropeway and a lot of other attractions. But that would be another story which follows later. Until then, remember to come back from Palakkad before office time, unless you don’t come back to the Cochin-Trichur side, as it gets really crowded on the roads, and with the potholes all around, there is a chance that you might miss your dinner. This entry was posted in India, Kerala and tagged dam, dhoni, fantasy park, indian coffee house, kerala border, malampuzha, malayalam, nature, palakkad, palghat, pattikkad, poori masala, reservior, vadakkanchery, vegetable cutlet. Bookmark the permalink. Hey, dear, I nominated you for the Liebster Award, I didn’t want to pick the same blog again, so I chose this one, I really like it, too! Hi teny, just wanted to drop by and say thank you for checking out our blog, and all the ‘likes’. I’ve been looking around and you have some great blogs. You are welcome 🙂 I loved ur take, & I would hope for Kerala to be part of ur blog on India sometime.